While I don’t give out specific earnings numbers, I’ll provide a few tidbits. January was more than double my typical month (see Five Figure Blogging). 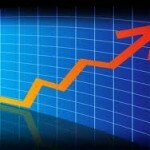 Adsense revenues exceeded $1000 for the first time in a looong time, primarily due to some great search traffic. See, visitors from Google are much more likely to click through an Adsense ad than social network or return visitors since they’re not necessarily coming to your site looking for a search term. When someone googles a particular term and I have a relevant article, there’s a relevant ad block up there. Included in this value would be other projects like ETFBASE and other cats and dogs where I derive a few bucks a day. Freelance work brought in a record amount as well. I don’t make what I used to from affiliate conversions – something I should work on. I lay out what affiliate ads are in The Economics of Blogging 2. I had a few direct ad placements for various things last month. The Yakezie network has been a big help in that arena, as I’ve been networking with great bloggers, as well as being included in various ad arrangements. Efficient Markets – Are You a Believer? States Stealing Gift Card Values? WTF!!! So, far, a great way to start off the year vs. my 2011 Blogging Goals. Looking to crush it this year! Do You Have Any Ambitious Projects for 2011? Sounds like a great month! Congratulations! Thanks Flexo, means a lot – from a guy with about 3 orders of magnitude the traffic! LOL! You deserve yours very much – an early pioneer! Good job and you deserve it. Your posts are always awesome. (Except maybe that one guest post some upstart blog did for you regarding economics of marriage). Thanks so much. Awww, I feel bad for that writer then – they actually worked really hard on that post and were really excited about it! Oh well, it was an A for Effort! Oh, I just caught myself – that was your post LOL! I was thinking it was some mean-spirited hater. I actually thought your article was well-researched, articulated and thorough! And so did commentors. OK, so I’m not nuts. Feel free to post again any time! Congratulations Darwin! You always post good content that really makes one think and reconsider conventional thinking! 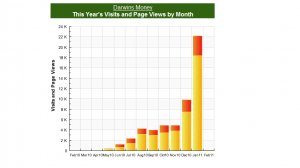 Are those numbers and revenue just for Darwin’s Money? Those are awesome results and I’m sincerely happy for you. You’ll have to share with me sometime how you have time to update so many sites 😉 … I’ve been considering launching a second site but I’ve been incredibly lazy in updating my travel blog and I’m behind on the main site from all the moving and other stuff done lately, but I have also noticed that I’ve been getting a bit more efficient overall as time passes by. Oh, I see the adsense includes everything. Still a very great result! I post some places once per week or so. Overall, it’s probably an average of a post per day. I write 2-3 articles some nights, then take Fridays, Saturdays off, etc. Not too bad – batch processing is the key! 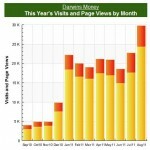 I recently launched my blog with the realization that it will take time to see any sort of traffic let alone income. After reading many different blogs for several months I decided to take the leap. One of the main reasons I started the blog is to keep myself focused in getting our debts paid off so I can start investing in income producing real estate, which has been a lifelong dream and goal. I enjoy reading these posts about how to get traffic to your site and the basic economics of blogging. Thanks for this article and congrats on getting a large jump in traffic. I think the MBA Mondays posts are really great too, I’m sure thry bring in a lot of traffic. That’s fantastic! The steep increase in traffic you had is very impressive, looking at where you started from. Good to see that you broke through, so to speak…it must feel great. Congratulations. My ambitious project is to be in the WISEBREAD 100 by year-end. I plan on sharing my progress every Friday. Congrats to you!! That is fantastic. You are an inspiration to the rest of us who have a ways to go to get our blogs to where yours is. One day you will have to share with us all of your secrets. Great job!!! 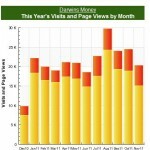 What an impressive increase in visits!!! And well, that starts to cascade into the other stats, so expect great numbers the following months. I’m sure you’ll have great news for us in the following months.